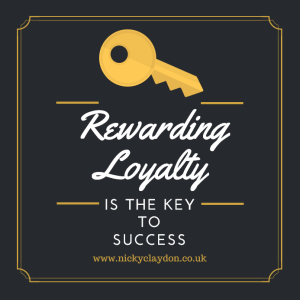 How to reward loyalty is something that often gets thought about and then completely forgotten by many small business owners. Through putting a good Relationship Marketing Strategy in place, as detailed in my Relationship Marketing Challenge, you should find yourself in the position of having lots of repeat business and referrals coming in from your happy customers and networking associates. Once you have this untapped flow of leads the one thing you must not do is take its source for granted. Have you thought about what will happen if these same people refer business to you again and again but never hear that you were pleased to receive their referral or given the courtesy of knowing if their referral(s) did, indeed, place business with you. If they find out that they have and they haven’t heard from you, how do you think that will make them feel? There is a good chance they will stop passing business your way! It is also important not to overlook those who are providing you with leads/business via any networking groups you attend. You may have received referrals through networking contacts that you have formed relationships with over time, who have never used your service, but have recommended you to people that they know having found out more about your business and feeling comfortable enough to recommend you. Do you think that they will keep referring you if you don’t thank/reward them for these FREE referrals even in a small way? If you have not considered using their service to date, perhaps this is something you should consider doing too. How about holding an annual VIP event for your best customers and networkers who refer business to you? Think of something novel and different which will really encourage people to want to attend. You could launch a new product or re-launch a product at the event too and/or present gifts to your top introducers. Take lots of pictures and publicise the event via social media (tagging attendees) which will, no doubt, peak lots of interest from those who know your business already along with people who weren’t aware of it before. If it looks fun to attend and exclusive and word gets out as to the criteria for being invited you will be surprised at how many people you know suddenly start introducing business to you! So what’s stopping you organising one of these events? If this is something you decide to do, I would love to hear how you get on. Do come back after arranging it and comment below. Have you ever thought about the consequence of not thanking your business contacts for any referrals they may give you? Whether you thank them simply by sending a card or by also sending a gift, this is something you must implement into your relationship marketing strategy. If you are not doing this you are doing UNTOLD DAMAGE TO YOUR REPUTATION & THAT OF YOUR BUSINESS! It is extremely important, therefore, to be sure to give every business contact that passes a referral to you a hearty and gracious ‘thank you’ immediately. A handwritten personal note is perfect as it provides that ‘feel good’ factor upon receipt but also serves as a reminder of a good deed done which other methods lack. Do remember to send a physical thank you in the post, even if you have seen the person and mentioned it personally as a verbal ‘thank-you’ is often forgotten. E-mail and telephone thanks are also no substitute for the personal touch that a card/gift can bring. Don’t assume you deserve the referral just because you told them at the beginning of the sales process that you expect referrals from happy customers. If, for example, one of your customers writes some business with you and then refers, say, three of their contacts, who also write business with you, what do you think will happen if you don’t say thank you to your customer for those referrals especially if the three pieces of business written are for a considerable amount? There isn’t any doubt that you wouldn’t have been referred unless they were happy with the way you carry out your business, but if they refer people to you and you don’t tell them you are grateful or show any other form of appreciation for those referrals what do you think will happen? Over a very short period of time your client could, very well, become apathetic towards you and feel that you have taken their referrals for granted. This will result in them referring someone else, and NOT YOU, in the future. Don’t use your company’s letterhead if sending a letter of thanks. High quality paper with your name and address, simply at the top of the paper, or a high quality greeting card are ideal to use. You don’t need it to be lengthy, just a few thoughtful lines expressing gratitude for the referral, informing them when you will next be in touch and a further thanks to close. Don’t send branded items as a referral thank you such as t-shirts, umbrellas or paperweights . Any item such as these will be a complete ‘turn-off’ upon receipt as it smacks of insincerity. 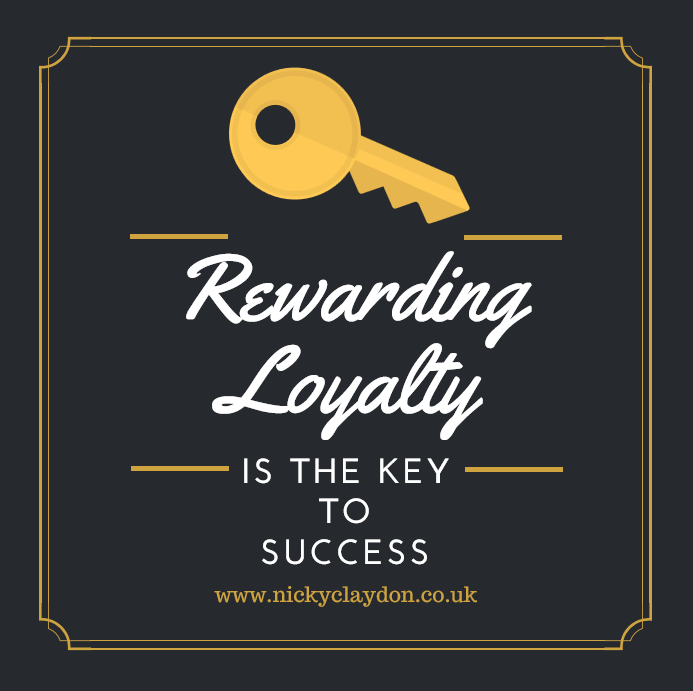 Any referral thank you gift given should be something personal to them for their use NOT something to help you promote your business. It is really important you give careful consideration to any gift you will be offering as a referral reward. If you only have a small budget it is perfectly acceptable to send a ‘thank you for the referral’ greeting card. It is better to send a card on its own rather than accompanying it with a small insignificant gift. Bear in mind that any gift given needs to be something that someone wouldn’t mind receiving more than once as this will incentivise them into referring more people to you in the future. The value of the gift also needs to be something that makes it worth their while to refer people to you, such as a £25/$30 gift voucher from a high-end store, money-off coupon to use for your product/service or a bottle of champagne. If your competition sends an e-mail or text and YOU send a handwritten card and include a gift, which of you is more likely to get a future referral? Yes – YOU! It is extremely important that you make this part of your Relationship Marketing Strategy. By formally sending thanks for referrals it will differentiate you from your competition. 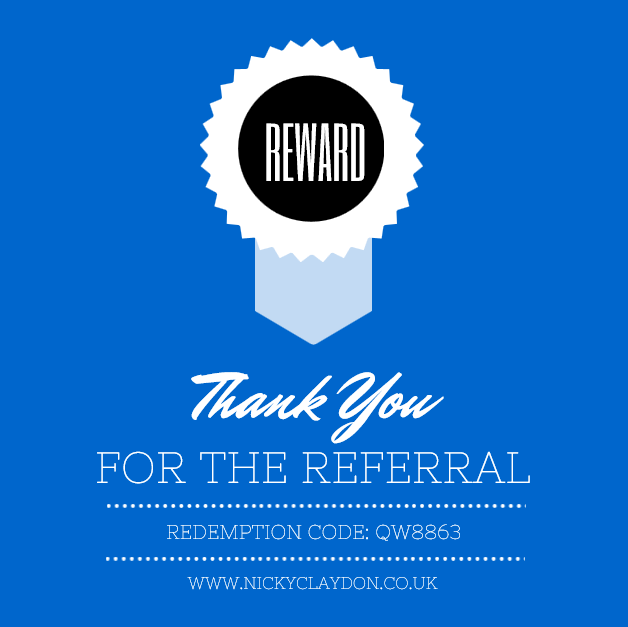 Referees who feel appreciated will generate even more repeat business and referrals for you in the future. They will consistently send their friends, family and business contacts to you and, most importantly, referrals cost you nothing! I hope you found this post useful. Please comment below on your thoughts with regard to referral thanks/rewards.